EnKor is a local, versatile choir founded in 2002 and made up of singers of different ages and nationalities. 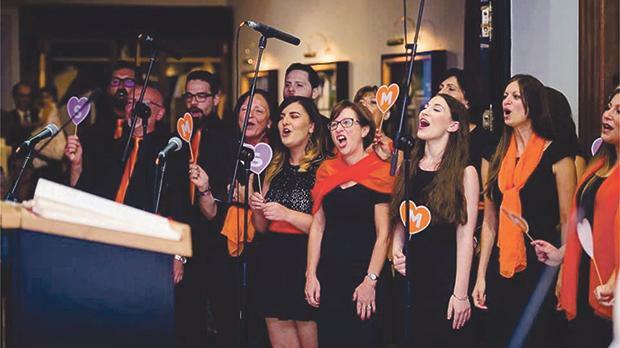 The choir, also known as #teamorange (for the orange accessories the singers wear) boasts a varied repertoire, performing pieces of many genres that range from classics like Elvis Presley’s Can’t Help Falling in Love, modern pop pieces like Only Hope, and finally its signature gospel and worship tunes. Tomorrow, EnKor will be holding a concert – A December to Remember – during which the audience will be treated to a most enjoyable evening of music as the choir takes it on a journey through the many years and genres of EnKor, including some signature Christmas classics that are sure to get all present into the Christmas spirit. The concert will be in aid of two local organisations. It all starts at 8.15pm at the University of Malta Chaplaincy. Tickets can be purchased from ticketline.com.mt. For more information on EnKor and A December to Remember, look up the choir on Facebook by following the link to facebook.com/EnKorMalta.